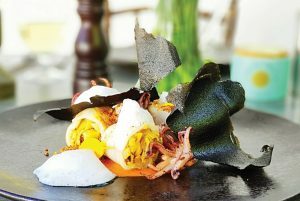 Sa Brisa Restaurante has made a name for itself as one of the best restaurants on Ibiza for many reasons, all of which are praised by international publications such as Michelin Guide, who value their experimental cookery, which combines the freshest island produce and international flavours. 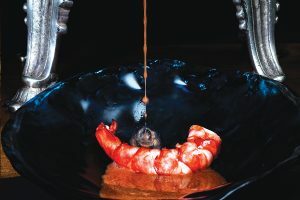 Their success is down to a solid and established team in constant training, led by Pere Vendrell and Esther Bonet, and a team of chefs with Gonzalo Aragüez at the helm. 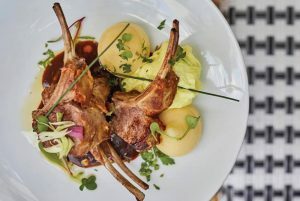 Aragüez came to Sa Brisa Restaurante to put his creative side to the test after 3 years sharing his talents and kitchen management skills with the famous Restaurante-Cabaret Lío. A team deeply in love with a concept of haute cuisine which aims to return focus to the importance of Ibizan dishes and produce, intertwined with international ingredients and just a dash of their own personality. Sa Brisa Restaurante & Catering is located in the island’s capital, accessible from Vara de Rey and the Plaza del Parque, though the ‘playfood’ concept reaches the furthest corners of the island, thanks to their catering service. We can recommend their tasting menus enough – you will be left open-mouthed. Or simply order about five tapas per couple, and don’t forget their wide range of desserts and cocktails. The culinary offering at Sa Brisa has delighted the most demanding of clientele, a group which is growing by the day. Welcome to the best culinary journey of your lives! Now, you can also find Sa Brisa in Madrid, on Avda. Menéndez Pelayo, 15.